Are you using the WordFence plugin? Do you have a Sucuri subscription service that runs scheduled malware scans? Have you received the error “Sucuri unable to properly scan your site” in your Sucuri dashboard? 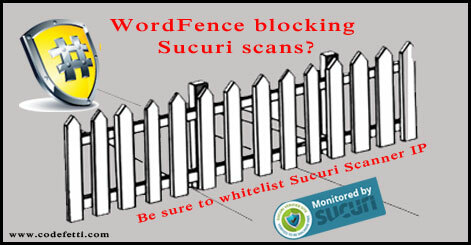 The problem occurs because the Sucuri monitor has been unable to connect to your WordPress site. This has happened to a few sites we maintain, and the issue seems to have emerged about the time that WordPress 4.o was released. And with that release, many plugins also were also upgraded to be compatible with WordPress 4.0. A quick support ticket to Sucuri and we were told that the IP monitor17.sucuri.net -192.155.94.43 was blocked. Support then asked if we were using mod_security or any other security plugin. Since we were using WordFence, we were advised to whitelist that IP. The fix is simple. Once we whitelisted their IP, everything ran properly. The next time the Sucuri scanner attempts to connect to your website the server will allow it and your scans will run as scheduled. Remember ~ it’s really important to watch your online platforms and subscriptions to make sure everything is up-to-date and running properly. Learn more about WordPress security and why it’s important to monitor your brand online.